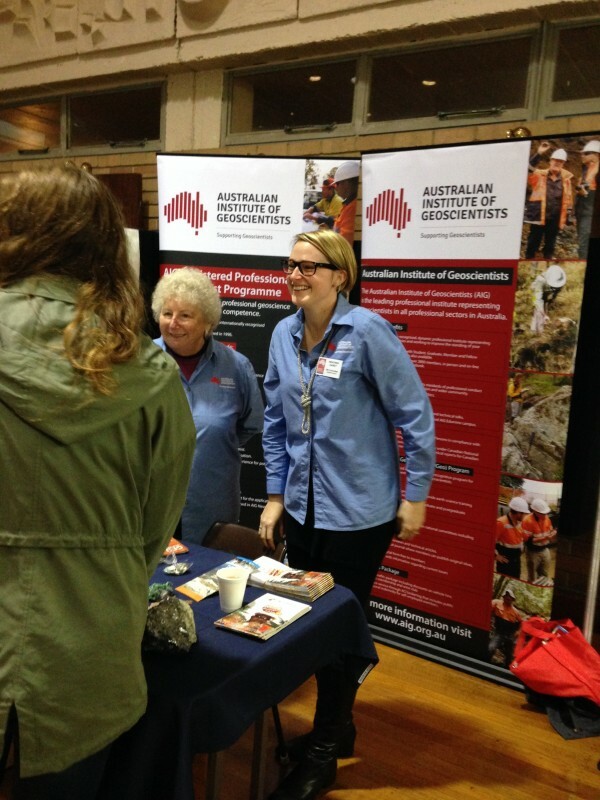 Recently the WA branches of AIG & ASEG participated in the annual Hale / St Mary’s Careers Expo. The night was well attended with exhibitors from local universities and various sectors including finance, hospitality, medicine, real estate, law, health, police, and GEOSCIENCE! This year marked our third year at the event and although it was a stormy night, many students benefitted from the displays and advice given by the exhibitors. AIG Councillor Heather Carey and Jocelyn Thomson speaking with students at the AIG stand. 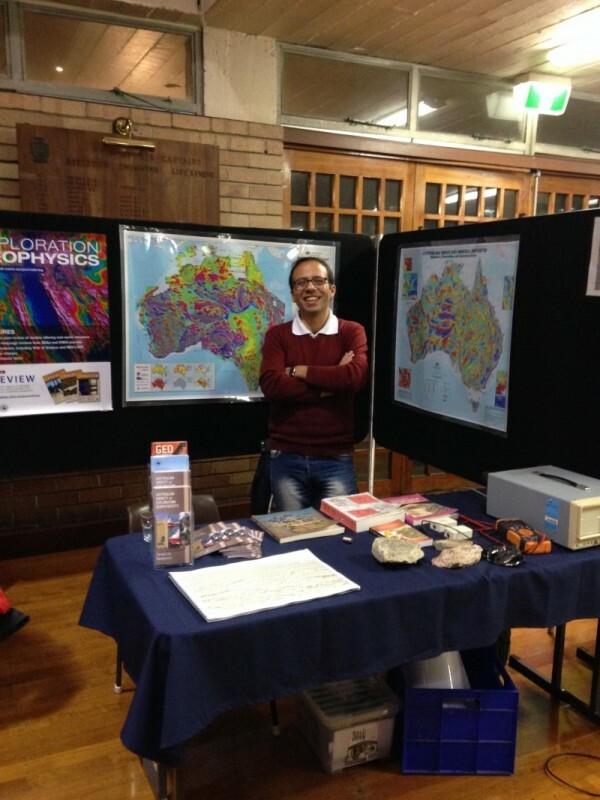 ASEG WA committee member Javad Khoshnavaz manning the ASEG stand at the expo. We look forward to an ongoing presence at career events like these, which give us the opportunity to encourage students to study math and science! According to the U.S. Bureau of Labor Statistics, the current young professionals work group (up to age 35), commonly referred to as “millennials” or “Gen Y’ers”, spends an average of 1.8 years in a job before moving on. At any one time, 60% of this group are looking for new career opportunities while still employed. Career and lifestyle aspirations are even more important to them than pay or their relationship with their managers. In addition, millennials do not need to be highly dissatisfied with their current job to make a change. If something more attractive comes across their radar screen, in the way of career advancement or lifestyle aspirations, they will leap, regardless of how long they have been with their current employer. Many companies are confused about how to successfully attract, engage, and retain millennial employees for long enough to train them to take over from aging “boomers”. However, some “early adopter” companies seem to be getting it right by creating a work environment that promotes flexible work-life arrangements and offers career support to address just these issues. Career support in this context includes leadership development, career planning and mentoring. A cost-effective way for mining companies to provide this type of career support is through the availability of appropriate elearning. Some mining companies already provide elearning as on-demand online courses that can be taken at the employee’s initiative; others provide it as structured programs of online courses with more clearly defined training objectives. Either way, the results can satisfy both employee and corporate requirements. From the employee point of view, provided the selection of courses is sufficiently large and the quality is acceptable, the benefits include career development, satisfaction of CPD (continuing professional development) obligations and, if the courses are accredited, accumulation of credit towards university programs. From the corporate point of view, the benefits include improved employee retention, employee knowledge and skills development, and achievement of corporate training objectives. For more on the topic of employee retention through provision of career support see Stop the Gen Y Revolving Door (B.L. Ware (2014)). AIG members have access to a dedicated Edumine campus that provides access to the full-range of e-learning resources that Edumine offers. For more information visit the Edumine Campus page of the AIG web site. Edumine Campus enrollment is managed through the AIG membership portal. Vice President Professional Development, InfoMine Inc., Vancouver CA. Simon is responsible for EduMine, the professional development division which provides learning and training programs to the global mining industry. He is a practicing professional engineer and author. This article was originally published on the Infomine web site www.infomine.com and appears here with permission. Earth and Environmental Science (EES) is a large component in the new Australian curriculum. Over the years 2011-13, Teacher Earth Science Education Programme (TESEP) representatives on the ACARA National Curriculum Board education committee, as well as geological society letters of endorsement, have had a significant part in influencing the current higher level of applied EES in the new national curriculum at junior science and at senior elective levels. The new integrated aspect of EES (as taught in junior/middle secondary) should encourage more students to elect to do EES at senior secondary and tertiary levels. TESEP teaching material is aimed at junior-middle secondary (with additional higher level material, activities and web links). 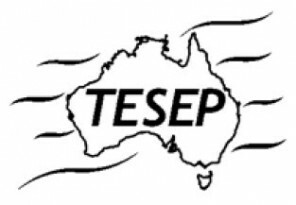 Teachers nationally – across five states and two territories (except WA) – have benefited from TESEP professional development workshops. Total of 1434 teacher attendances, 120 one-day PD workshops, in 25 locations (as of 03 April 2014). The multiplier effect of each teacher influencing 2 to 5 other teachers results in over 400,000 students being impacted by TESEP EES teaching resources. Teachers recognise the direct application of TESEP’s teaching resource material and its place in the new Australian Curriculum. Year 8 focus (in 2013 curriculum rollout) has been PD1 Round & Round with Rocks (from ore to metal) and Year 9 focus (in 2014 curriculum rollout) is been addressed with a new PD9 Plate Tectonics teaching unit (the framework around the eight existing topics of energy, minerals, groundwater and climate). This has been well-received. Overwhelmingly, positive teacher feedback – on PD theory and hands-on exercises and fieldtrip/site visits. Teachers from upper primary, trainee, and all levels of secondary (from Science, Maths, Geography streams) have attended. Feedback comments – ‘having the blinkers lifted’ and there have been requests for more ‘difficult’ EES topics. After winning the AAPG Harrison Schmitt Award 2012 , the TESEP Board (comprised of representatives from Australian Geoscience Council (AGC), AIG, PESA, AusIMM, MCA, GA, ASTA) urged the team to keep up the momentum and continue face-to-face workshops, particularly in new locations. Steps to convert PDs to online format for online webinar delivery ensure that as many teachers in new and existing locations have access to all of ‘The Challenging Earth’ series PD workshops. Field excursions/mine visits will be integral to many PD workshops (depending on the location), and in-kind support of mining and exploration industry staff in guided tours and short talks is sought. Teachers have been very enthusiastic about the 15 field excursions and 18 tours of mine sites/laboratories/geo-museums previously run. Teachers have particularly appreciated the participation by industry and academic professionals. TESEP is running to budget, with approximately $239 000 funds remaining. New PD9 Plate Tectonics – a new PD on this overarching theme (to meet the needs of year 9 curriculum rollout in 2014). Completion of the original planned 112 PD workshops and the continued running of face-to-face professional development PD workshops. Significant rural TESEP hubs have developed at Dubbo NSW, Gladstone and Rockhampton Qld and Burnie Tas. Some workshops include half-day fieldtrips (mine site visits). Industry professionals (PESA, AusIMM, mines departments) have assisted as in-kind support. Webinar trials have been run on two topics, for a 4 x 1hr or 6 x 1hr once-weekly format. This gives remote teachers (and others with time-constraints) the flexibility to be involved in PDs in an after-school hours timeslot, where they can ask the presenter questions online, as well as to do the webinar at another time of their choosing. Development of a case studies supplement to the national Year 11-12 textbook for Earth and Environmental Science (developed by Earth Science WA) – this consists of the development of national case studies that give teachers local and regional examples from all over Australia. Ten have been drafted so far from work submitted by academic, industry and society geologists of diverse backgrounds from across Australia. Coordination is being undertaken by TESEP Executive Officer Greg McNamara. Case studies will be uploaded to our website for free downloading by teachers. Development of field guides for teachers and students – simply-worded stop-by-stop descriptive guides for teachers and worksheet questions for various year levels. TESEP presenters have tested several new field trips and set up student and teacher worksheets and pre-trip questions, eg Sydney Basin Illawarra Coast NSW fluvial and coal stratigraphy, Otway Basin Vic shelfal stratigraphy, Western Victoria Volcanics, Sleeps Hill/Jupiter Creek Gold SA. Site visits and collaborations: 18 excited teachers were flown to OzMinerals’ Prominent Hill Copper Mine SA and staff guided them through how this opencut mine operates, Melbourne Museum hosted several PDs and staff discussed their Dynamic Earth Exhibition, Scienceworks/Planetarium held PDs on climate and VSSEC hosted PDs on Our Place in Space. Free downloadable teaching materials and approachable presenters and coordinators: TESEP evergreen website www.tesep.org.au (TESEP EO is webmaster), local state coordinator contacts in all states and territories (except WA) and freely downloadable PD teaching material on www.geosciencepathways.org.au (webmaster cofunded by PESA and ASEG). AAPG-funded 2014 planned trial of TESEP PD teaching material in Jakarta, Indonesia – by local university staff and students (after training by TESEP and AAPG presenters). We hope you have enjoyed reading about the 2013 success of TESEP. The TESEP team looks forward to discussing future funding of 2014-2016 TESEP with you. Enquiries can be addressed to Jill Stevens (Chairperson) or Greg McNamara (Executive Officer). Visit the TESEP website or Facebook for further information. AIG WA Branch committee members were involved in the Kent Street High School (Perth WA) – Curtin University Mining Challenge, held last week, for the second consecutive year. A collaboration between these two education institutions, the initiative is aimed at creating resources industry career awareness amongst primary school students. Ultimately, the Mining Challenge provides recognition for a mining based educational pathway for the primary school students to pursue as they transition firstly into secondary education at Kent Street and then progress on to Curtin for undergraduate studies at the Western Australian School of Mines. Both Kent Street and Curtin are renowned for their resources education throughout Western Australia. Each year, up to half of Kent Street’s Earth and Environmental Science class progress to Curtin to pursue either geoscience, mining engineering or metallurgy degrees. The event theme was “You need to find it to mine it”. 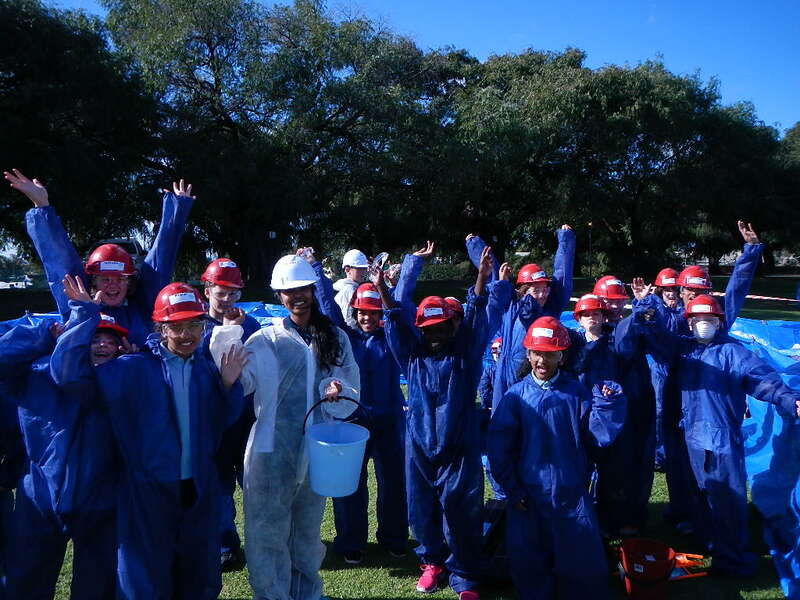 The challenge involves 180 primary school students from six local primary schools who are mentored, led and managed by Year 9 Kent Street students to compete in a series of mining activities. It is a huge day for both the students and the judges. The winning school receives $1000 of scientific based Lego and both female and male miners and mine managers are also rewarded. The AIG judges are responsible for awarding points related to team work, construction and environmental awareness. Getting ready to process the ore. Year 9 mentor – Devika is rallying the Victoria Park Primary school students to get ready for the next challenge. Victoria Park Primary won the event by 0.5 point from Gibb Street Primary School. 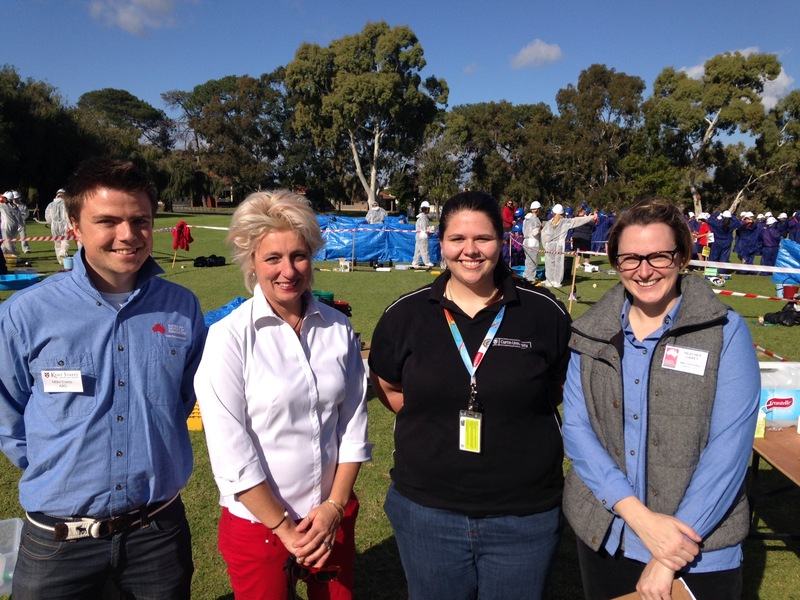 Four AIG WA committee members and two other AIG members, geologists Peter Pring and Michael Outhwaite, were involved in the coordination and judging of the event. Myself, a teacher and geologist from Kent Street, worked with the Curtin contingent of which Sam, a 3rd year Applied Geology student from Curtin University, was one to organise the day. Heather and Mike, who are also AIG Councillors, both volunteered their time to judge. Four of the event judges: Mike Curtis, Suzy Urbaniak, Samantha Murray and Heather Carey. The other judges were Michael Outhwaite & Peter Pring. Resources Outreach to school students is an important activity for AIG’s WA Branch. Historically, AIG WA’s support of Kent Street Geoscience has positively resulted in the generation of young resources graduates and this Mining Challenge further cements our commitment to education. A much needed sustainable approach, this strategy ensures that our industry can draw on home-skilled talent beyond 2020. 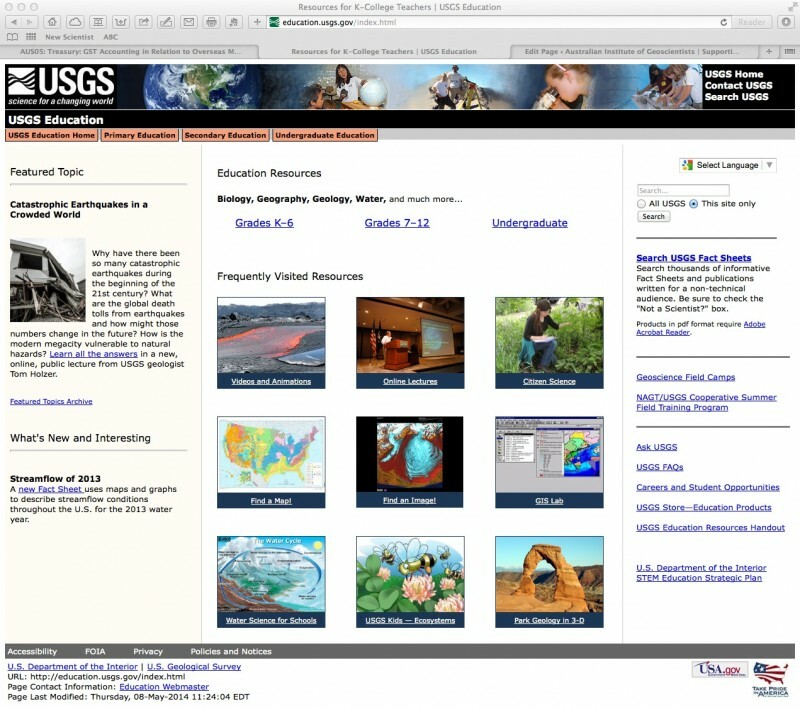 Geoscience educators in Australia may not be aware that the U.S. Geological Survey publishes a wide range of geoscience teaching resources on a dedicated web site education.usgs.gov. The USGS is the largest public geoscience organisation in the world. Their education web site provides teachers with links to lesson plans and a wide range of background materials and images, access to maps, videos and on-line lectures that are valuable resources in lesson development, most of which are available free of charge.